Research Investigation Challenges Create Interesting Week for TeamSherlock Investigations Inc.
As research investigators, our job description probably isn’t transparent to most. We essentially handle everything and anything that doesn’t fit the mold of a surveillance investigation. We work from behind a computer screen with a telephone, research manuals and Red Bull. We don’t get out much! Basically, we dig for information through a variety of sources; HUMINT, OSINT, SIGINT are some of the areas we specialize in, which essentially means that if a piece of information is available, we can find it. A lot of our clients use our expertise to help track people down, find that shred of evidence that can help their case, discredit a party to a lawsuit or claim and even to prepare themselves for depositions and trials. Not to mention that we work to setup our surveillance team so that they can select the right times/days to be in the field. Every case is different, and every case is interesting, but once and a while there is a case that stands out as truly unique in scope. This week, a simple request came in, that despite being unassuming and straightforward, created a real challenge. Simple right? People sign things all the time? That is what came to mind when we set about handling this case. The only trouble was finding something that is public record and available (and recent) to obtain. The first thought on this one was to locate a copy of the claimant’s deed. Immediately we were shut down in our efforts; finding that the claimant doesn’t own his residence. A landlord and any rental documents are not public and although it might be worth a try to tactfully contact the landlord, we also learned that the claimant wasn’t likely to be listed on the lease anyway. At this point, we were really scratching our heads. 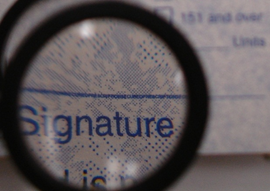 Driver’s license signatures are not available publicly, even with access to the Secretary of State, we can only see the data; no photos, no signatures. Our next thought was to walk through the subject’s background to see if we could find anything that stood out as requiring a signature, like a business registration document or court filing on another case. Honestly, we were even hoping he would have been nice enough to have posted a sample signature on social media… Hey, you never know what you will find on Facebook! Through our searches, we discovered that a couple of years back, the subject spent some time in county lock up. This was the break we needed, knowing that a ton of signatures are required to enter and leave the judicial system, the most recent of which is usually the subject’s signature on the property release form that all inmates are required to sign when leaving jail. After contact with the local Sheriff’s Office, we were in business. An 18 month old signature to compare to the release form presented by a treating physician that our client found suspicious. While not the most exciting case in history, it is matters like this that can be the most interesting to a research investigator here at Sherlock Investigations. If you ever find yourself in need of a tough or oddball piece of information, we encourage you to give our team a call to see what we can come up with for your unique situation. We look forward to the challenge! This entry was posted on Monday, February 12th, 2018 at 5:34 pm and is filed under Uncategorized. You can follow any responses to this entry through the RSS 2.0 feed. Both comments and pings are currently closed.